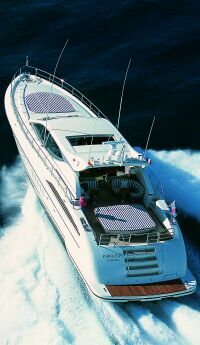 The Arno boatyard has been producing the lucky Leopard series for over 15 years now. An unstoppable evolution that this year has launched a 24 metre with completely renewed external and technical characteristics. The Rodriguez group, exclusive to the Arno boatyard, after having marketed over 100 units of sizes ranging from 20 to 27 metres over the years, intends to offer its clients a modern, refined boat with this new Millenium. 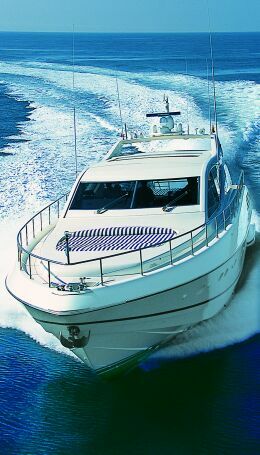 As per Leopard line traditions, in this case too the bottom is a deep V-shape, to guarantee good seaworthiness and high level boating comfort. Again following a by now consolidated pattern of the Leopard line, the new Millenium also has a rakish hard top, developed with streamlined lines, that unites the stern area with the external dinette and the control deck. Andrea Bacigalupo, its designer, has carried out a very meticulous job in realising the design of this open. Among the prominent characteristics of the project we can also find an important new idea for this Tuscan boatyard, water-jet transmission coupled with two 1,500 HP 2000 series MTU's. This choice has called for a careful study of development of the waterlines to obtain maximum performance in the hull propulsion combination. The result, according to the boatyard and Kamewa technicians is a top speed of 40 knots, which, considering the size of this yacht, is an interesting factor. Apart from performance the advantages offered by water-jet propulsion regard boating comfort; in fact, this type of propulsion ensures particularly low noise levels and the almost complete absence of vibrations, even at high speeds. 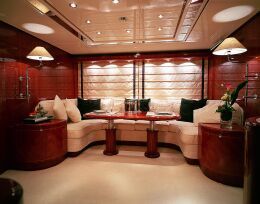 The interiors, beautifully finished throughout, are very light and airy below deck, in particular the saloon and the office corner, which benefit from natural light from the wide lateral portholes. The external layout is original and streamlined, emphasised by the long continual side windows,. 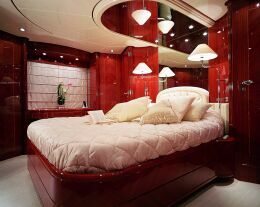 Another element, characteristic from an aesthetic point of view is the presence along the bulwark of six vertical portholes located in the main area to grant more light to the saloon, as well as giving this yacht that extra touch of personality that never does any harm. Its profile is very pleasant, thanks to its soft but rakish lines that run from stem to stern in a continuous, harmonious way. 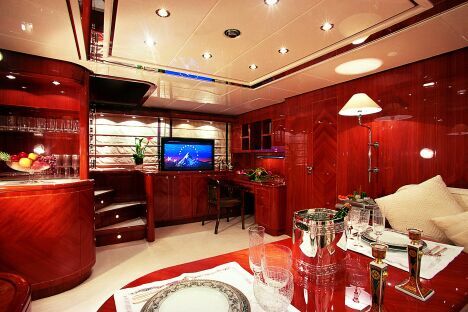 The internal layout is characterised by the presence of the crew quarters astern in the main area, where there is a cabin for the master with private bathroom and direct access to the engine room. Again for the crew the designers have realised a completely independent living area. 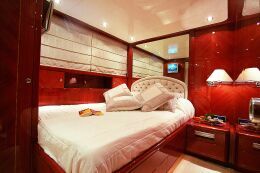 The sleeping area for the owner and his guests includes a large owner's suite in the bow, equipped with all necessary comforts and loads of space, as well as two bathrooms and two office areas. 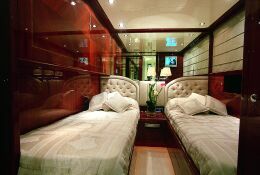 Astern of this cabin there are another two cabins for guests, one to starboard, with a double bed and the other to port, with twin beds; both have private bathroom. For the control station the boatyard has opted for modern fittings, into which a large number of cutting edge devices have been inserted. The Leopard 24 Millenium will have the not so easy task of replacing the 23 metre hard top, the yacht with which the yard has had great success, but the pointers for success are all there.